It came in the form of the Yazoo Land Act, but let's back up a bit. I snap digital images of gravestones all the time, often having no clue who I'm photographing. And this was easily the case when I visited the Revolutionary War Cemetery at Louisville, Jefferson County, Georgia (also known as Old Capitol Cemetery, or Old City Cemetery). It was not a planned visit, and I was looking for no one in particular. The simple ledger marker for James Gunn, however, piqued my interest. A Brigadier General? Well this might be someone I can research. who died on the 30 of July 1801. Died at Louifville, Georgia, on Thurfday the 30th inft. the honorable James Gunn, brigadier general of the firft brigade of the firft divifion of the militia of Georgia, and for many years paft a fenator in Congrefs from that ftate. On the following day the laft melancholy teftimony of refpect to his memory was fhewn by the refpectable citizens of Louifville, by whom his body was interred with military honors. In 1794 he [James Gunn] and a group of associates formed the Georgia Company. This and three other similar companies worked together through the early and mid part of 1794 to clandestinely bribe members of the state legislature to pass what in history became known as the Yazoo Act. Gunn waited until November 26, 1794, thirteen days after his reelection to the U.S. Senate, to formally submit the Georgia Company’s proposal to the legislature. The act, once passed, conveyed about 3/5ths of Georgia’s western territory to the four private companies for a pittance. Pressure to act continued to build on legislators until, by mid-November 1794, a majority reportedly favored the sale of the western territory. On January 7, 1795, Georgia governor George Mathews signed the Yazoo Act, which transferred 35 million acres in present-day Alabama and Mississippi to four companies for $500,000. To achieve this successful sale, the leader of the Yazooists, Georgia's Federalist U.S. senator James Gunn, had arranged the distribution of money and Yazoo land to legislators, state officials, newspaper editors, and other influential Georgians. Cries of bribery and corruption accompanied the Yazoo Act as it made its way to final passage. Angry Georgians protested the sale in petitions and street demonstrations. Despite the swelling opposition, the Yazoo companies completed their purchases. ...It may be said in justice the memory of General Gunn that some of the foremost public men of the day were concerned in the Yazoo land deals, among them Patrick Henry, of Virginia; Thomas Glascock, of Georgia; and other patriots of the Revolution. They regarded the transaction purely in the light of a business matter. There were no railroads in those days. It seemed hardly within the bounds of reason to expect any expansion of the State's populated area to a region so remote; and the lands for this reason were comparatively worthless. ...General Gunn's death, in 1801, was probably hastened by the unpleasant notoriety to which he was subjected. To quiet the claim of James Gunn, to the estates, real and personal, of General James Gunn, deceased. WHEREAS it has been represented to this Legislature, that Brigadier General James Gunn, died testate; and it appearing from the strongest presumptive testimony, that he left a will and testament, but that the same has been lost or destroyed, so that there is no probability of its being found; And whereas it also appears to have been the wish, desire and intention of the said General James Gunn, that his nephew, James Gunn, of the State of Virginia, should inherit, possess and enjoy, his estate, real and personal. 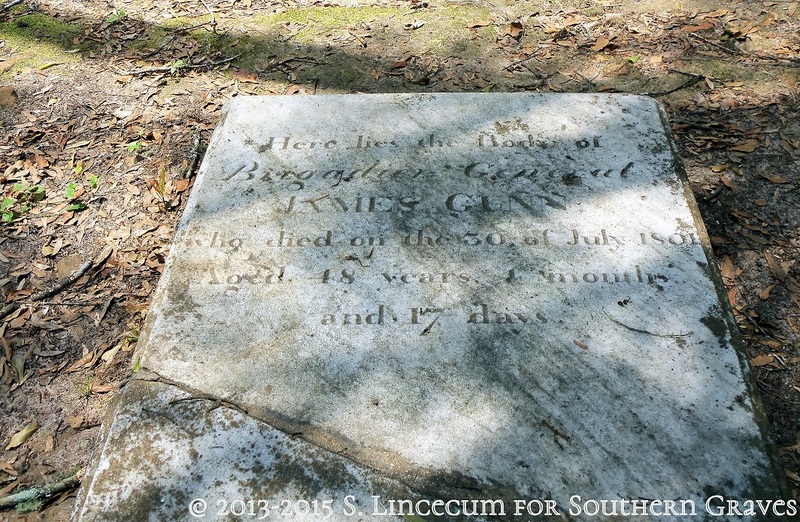 So goes the complex story of Brigadier General James Gunn, belied by a simple ledger marker in an old cemetery.